During his State of the State tour early this month, Governor Andrew Cuomo proposed a trio of major reforms hailed as important steps toward modernizing New York’s antiquated electoral system and increasing the state’s paltry voter turnout. While they are long-called for proposals that many are pleased to see Cuomo promote, implementing these goals could be more complicated than it may seem. Two of the three reforms, early voting and automatic voter registration, were outlined in Cuomo’s 2016 agenda, but the initiatives failed to move through the Legislature last year due to opposition from Senate Republicans, who control that chamber. It is a power structure that continues into the 2017 session, meaning the road to passage is uphill, and steeply so. 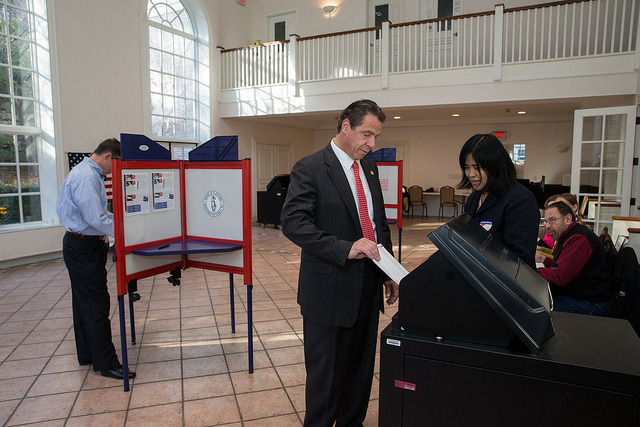 New York is one of only about a dozen states without some semblance of early voting. While the state already has a form of automatic voter registration through the Department of Motor Vehicles, Cuomo’s proposal is to streamline and expand the practice. If passed, it would amount to more widespread automatic registration, but not universal. The third electoral proposal from Cuomo, same-day registration, will likely require a constitutional amendment -- meaning approval from two consecutive classes of the state Legislature, then voters via ballot referendum -- a process that would take at least three years. There is some debate among constitutional law experts over whether such an amendment is required for any form of same-day registration, which would allow voters to show up at the polls to both register and vote on the same day. 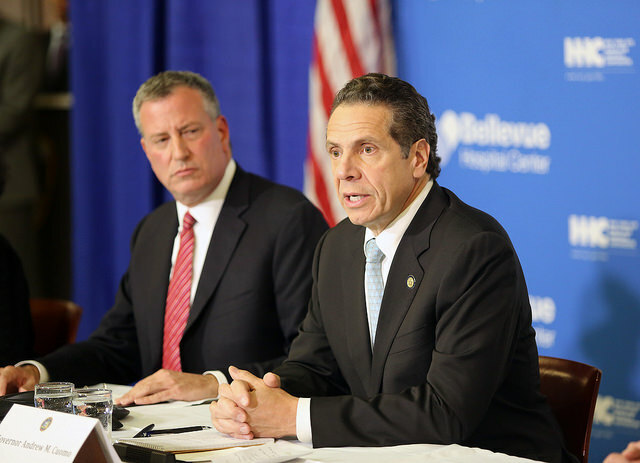 The three reforms are almost universally seen as long overdue in New York. Voter turnout in New York is especially poor: in 2014, the state ranked 49th of the country’s 50 states. While New York has watched many other states change voting laws to increase access to the ballot, the voter turnout deficit here is growing progressively worse, with just 19.7 percent of eligible voters casting their ballots in the 2016 presidential primaries. Turnout numbers have also consistently declined during gubernatorial elections and, in New York City, during mayoral election years. Those with high praise for Cuomo’s 2017 electoral agenda include Attorney General Eric Schneiderman, who, after monitoring the state’s four election days of 2016, issued an exhaustive report with areas for reform at the end of the year. In the statement, Schneiderman also recommended consolidating New York's exhausting voting schedule into a single primary. In 2016, there were three: in April for the presidential race; in June for congressional races; and in September for state legislative races. While it is still early to speculate exactly how the Legislature will respond to Cuomo’s electoral reform agenda, there are key early markers, process details, and implementation questions ahead of whatever policy debate may occur. One thing is certain: Democrats in the Assembly, where they have the majority, and in the Senate, where they do not, will be behind the election and voting modernization efforts -- including and beyond Cuomo’s three main proposals. What is less clear is whether the governor will fully push for early voting, automatic voter registration, and same-day registration in budget negotiations, which are just beginning; and whether there is any room for passage in the Republican-controlled Senate, perhaps with the help of the Independent Democratic Conference -- the seven-member body that has formed a ruling coalition with the Senate GOP. When it comes to early voting, New York is one of just 13 states without some window wherein voters can cast ballots before Election Day. For several years running, an early voting bill has passed the Assembly, only to be blocked in the Senate. According to Gov. Cuomo’s 2017 proposal, every county would offer residents access to at least one early voting poll site for every 50,000 residents during the 12 days leading up to Election Day. Voters would be guaranteed eight hours on weekdays and five hours on weekends to cast early ballots, and bipartisan county boards of elections would determine locations of the early poll sites. While high voter participation would ideally be a bipartisan issue, New York Republicans -- who cling to control of the state Senate by a tiny margin -- have calculated that better ballot access and more participation is likely to turn out Democratic voters, according Senator Michael Gianaris, a Democrat from Queens and outspoken proponent of voting reform. A spokesperson for Senate Republicans did not return multiple requests for comment. A natural partner of early voting is absentee voting. In his State of the State policy book, Gov. Cuomo, a second term Democrat, also cited the requirement for absentee ballot voters to provide an excuse, which is written into the state constitution and its removal would require a constitutional amendment. A bill to remove this requirement from the constitution has passed the Assembly and is, like other voting reforms, awaiting Senate approval. Senator Joseph Addabbo, who co-sponsored the bill and served as chair of the Senate Election Committee in 2009, said his staff has not looked closely at the governor’s plan yet but expressed hopeful optimism about the governor’s electoral reform agenda. In addition to persuading the Senate majority, Cuomo and Assembly Democrats will have to hash out the details with counties, which, while supportive of early voting, want the governor to include a provision for who would foot the bill -- approximately $3 million per year, according to one estimate -- for the additional polling options. "Despite principled visions on the issue, on the fiscal nature of the cost shift it's unconscionable for the state to be shifting and enacting policies these days in the property-tax-cap era. It should be dead on arrival." Stephen Acquario, executive director of the state Association of Counties, told the USA Today Network. Automatically registering voters when they become eligible or when they come into contact with government agencies is a fairly new concept. Since 2015, automatic voter registration -- which can have different forms and meanings short of universal automatic registration of voters once they become eligible -- has been approved in six states with strong bipartisan support and is taking off across the country, according to the Brennan Center for Justice. The idea is to shift the onus of registering from the individual to the government. In addition to increasing voter registration in other states, automatic voter registration has been shown to have significant benefits for administrators, reduce costs, and improve the accuracy of electronic poll books. Cuomo’s proposal, recycled from last year, would automatically register anyone who comes into contact with a state Department of Motor Vehicles, unless the person chooses to opt out. Currently, eligible voters can register through the DMV, but they must provide additional voting information as they apply for DMV services. Cuomo’s proposed version of automatic registration is preferable to similar bills passed in Oregon and California, which only registers eligible citizens who apply for or renew a driver’s license. 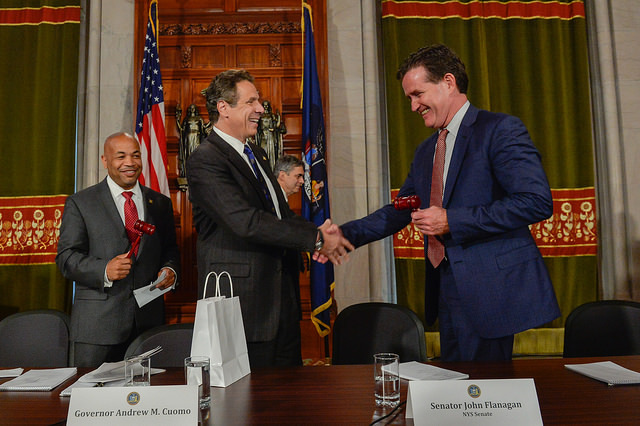 However, Cuomo’s plan is not as inclusive as say, that which is outlined in New York’s Voter Empowerment Act, sponsored by Senator Gianaris and Assemblymember Brian Kavanagh, which would enable a variety government agencies to automatically register voters. The Brennan Center outlines four ways that states can modernize their electoral systems with automatic registration. The first, of course, is by automatically registering anyone who interacts with government offices, unless the person declines registration. The second is portability, which ensures that registered voters remain on the voter rolls even after they move within the state. The third, online access, allows voters to register, check, and update their registration records through a web portal. And fourth, the state should provide a “safety net,” that allows citizens to correct errors on the voter rolls or register before and on Election Day. DMVs; Medicaid and public assistance offices; colleges and high schools; military recruiters and other military offices; unemployment and other public benefit offices; firearm licensing agencies; immigration offices; government-funded job-training centers; law enforcement and corrections agencies that interact with people who regain their voting rights after a criminal conviction. Some community groups have raised concerns that tying automatic voter registration to the DMV alone may skew registration number in favor of areas with high rates of car ownership, disproportionality impacting upstate voters over New York City, for example. Researchers at the Brennan Center are exploring whether data can shed light on the concern that automatic registration through the DMV advantages some groups over others. Same-day voter registration, perhaps the boldest of Cuomo’s proposals, would allow New Yorkers to register and vote on the same day. Currently, New Yorkers must register to vote 25 days prior to an election, though the state constitution's requirement is only ten days. Depending on how it would be implemented, same-day registration may require a constitutional amendment. However, if early voting is passed, there are legal experts who argue that the constitution would allow same-day registration for those who vote prior to ten days before Election Day. Again, a constitutional amendment is typically at minimum a three-year process which would require two “yes” votes from consecutive Legislatures and the passage of referendum on the following year’s general election ballot. Alternately, a “yes” vote on the constitutional convention referendum, which will be on the ballot this November, could provide another avenue to remove restrictions and institute reforms like same-day registration. At this point, 13 states and the District of Columbia have same-day voter registration, and California, Vermont, and Hawaii have approved the provision, though it has not yet been implemented, according to Cuomo’s office. The upcoming opportunity to amend the state constitution via constitutional convention, which, for New Yorkers, appears as a ballot referendum every 20 years will be November 7, 2017. A constitutional convention is a four-year public process that could result significant changes to the entire document and laws of the state. If New Yorkers say “yes” to a convention on this year’s ballot, a year later, voters will select delegates to participate in the convention; the following year, in 2019, the convention will convene; and voters will be able to vote on any proposed changes the following Election Day. Like with the electoral and voting reforms Gov. Cuomo has proposed, he has expressed varying degrees of support for a "yes" vote on a constitutional convention, but whether the governor takes significant action will go a long way toward determining the outcome. "Mayor of the City of New York, frustrated with Albany? Now there's a shocker," Gov. Andrew Cuomo responded on Thursday to reporters who inquired about Mayor Bill de Blasio's concerns over Albany's reluctance to deliver more than simple extenders of policies like mayoral control of schools and rent regulations that impact millions of city residents. An 11:30 a.m. press conference will be led by Democratic State Senators, including bill sponsor Joseph Addabbo, calling for passage of the Paid Family Leave Insurance Act in the Republican-controlled Senate. The companion bill, sponsored by Assembly Member Cathy Nolan, passed in the Democrat-controlled Assembly in March. Addabbo’s bill failed a Senate vote two weeks later, just before a fiscal year 2016 budget deal was reached. Though a new cloud hangs over the Legislature after federal corruption charges were brought against Republican Senate Majority Leader Dean Skelos on Monday, it does not appear that substantive policy work in the capital will completely halt. There is reason to be skeptical that legislation will be approved by both houses to ensure New Yorkers are able to take paid leave to care for a sick family member or spend time with a new child, but the issue has captured the attention of many, and has gained new momentum at the city, state, and federal levels. Negotiations over the paremeters of any paid family leave bill could be among the highest profile in Albany and legislative action on this issue could again make New York a national policy-making leader - perhaps garnering the type of positive attention the state could use given its growing reputation for corruption in its elected ranks. New York could become just the fourth state to pass a paid family leave law. Gillibrand’s comments came during a video message that was played last Thursday at an event in New York City - and livecast to sister events in cities across the state - organized by the Paid Family Leave Insurance Campaign, which is at the heart of the Albany lobbying set for Wednesday. The campaign is made up of advocacy groups, unions, and elected officials; members include 1199 SEIU, 32BJ SEIU, Citizen Action of New York, Community Service Society, New York Civil Liberties Union, New York Paid Leave Coalition, and the NYS AFL-CIO. On Friday, Gillibrand expressed optimism about paid family leave, and said she is working both with leaders in New York state government and also pushing her bill on the federal level. Representing the Obama administration, U.S. Secretary of Labor Thomas Perez also recorded a message that was played to those in attendance last week. Perez and White House senior adviser Valerie Jarrett have been traveling the country promoting paid leave in what the administration is calling "Lead on Leave." It was Jarrett who previously met with New York officials. At this point, however, movement on paid family is most likely to occur at the state level of government, at least between now and the summer. Looking to Albany, the New York City Council passed a resolution last week recommending that the state pass the Paid Family Leave Act. In her remarks at Thursday’s event, New York City Public Advocate Letitia James said that her office’s report on the subject indicates that Albany is the best place for legislation to occur. While there is support for the general principle of paid family leave in both houses of the Legislature and from Governor Andrew Cuomo, there is no clear path forward in terms of policy specifics. A key sticking point, of course, is where the funding will come from to pay for the employee leave involved. If some version of paid family leave is to pass both houses of the New York State Legislature and head to Governor Cuomo’s desk, it is unlikely it will be the Addabbo-Nolan version. A different paid family leave proposal in the Senate, sponsored by Independent Democratic Conference Leader Jeff Klein, differs from the Addabbo-Nolan bill on the source of funding. Klein’s version was included in the Senate’s one-house budget, but no compromise was reached in order to include paid family leave in the final state budget deal at the end of March, pushing the issue into legislative session. Governor Cuomo has expressed support for the issue, but he seemed to be caught off guard by the momentum behind it after he had declared there to be little appetite for paid family leave while he worked to pass his ten-plank women’s equality agenda, which is now moving through the Legislature in pieces. Cuomo’s office recently indicated that leaders of the majorities from each house do not seem close on a paid family leave deal. It was unclear if his administration is doing anything to facilitate compromise. In summarizing last Thursday’s rally, a press release from the New York Paid Family Leave Insurance Campaign says that significant lobbying efforts are set to begin: “In each region, labor and community leaders identified local actions and events to mobilize citizens between now and the end of the legislative session.” Wednesday’s event in Albany will be a major part of these efforts, but it remains to be seen how much attention any issue can get with Albany in further disarray. The conversation around paid family leave has gained traction nationally since President Obama mentioned it in his State of the Union address earlier this year. The President is attempting to pass the Healthy Families Act to create a $2 billion fund to help states implement paid family leave. Senator Gillibrand has introduced the federal Family and Medical Insurance Leave (FAMILY) Act, which has 12 Democrat co-sponsors. While federal aid could provide a significant push, New York does already have the mechanisms to implement paid family leave. But, reticence among business leaders about what they see as another possible regulation and potentially unfunded mandate is shared by Republicans (and some Democrats) who staunchly refuse to lay the burden for paid leave on employers. 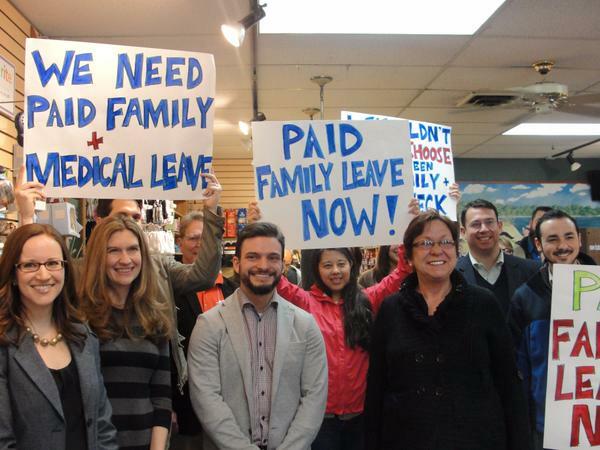 The concerns about the law raised by the business community seem unsubstantiated when the experiences of other states with paid family leave are taken into account. Meanwhile, the Nolan-Addabbo version of paid leave actually bases it on employee contributions rather than state funding. The Klein version, which appears to at least have some support from Senate Republicans, calls for the state to pay at least $125 million in the first year of implementation with the following years supplemented by employee payroll fees. In California, a paid family leave (PFL) law was passed in 2002 and went into effect in July 2004. In the years since, the fears that businesses had about the effect of PFL on their productivity and the local economy turned out to be unfounded. According to a 2011 report by the Center for Economic and Policy Research (CEPR), 89 percent of employers said that PFL had a “positive effect” or “no noticeable effect” on productivity and 91 percent said the same about profitability and performance. (The report was based on a survey of 253 employers and 500 individuals conducted in 2009 and 2010). Twombly insists that paid family leave helps businesses avoid the costs of hiring and training new employees and evens the playing field for businesses that already provide certain benefits to their employees. Citing a poll conducted in 2013, Rettig said business owners are in favor of policies based in shared contributions or employee payroll deductions. But the challenge for New York is clarity in policy. “A lot of times these policies are piecemeal,” Rettig said. “They’re cobbled together. Businesses don’t look forward to that.” Although he conceded that it would be tough to expand temporary disability insurance to pay for paid family leave, a cost that would fall on employers, he argues “It makes business sense at the end of the day. There’s no evidence to support the fact that it isn’t working for businesses. There is evidence to the contrary. Business owners get this. They just want to make sure it happens in the right way,” Rettig said. Senator Klein has been trying to champion his version of paid family leave through the Senate, albeit by separating it from TDI. "Including Paid Family Leave in the Senate’s one-house budget was a major step forward for New Yorkers,” Klein said in a statement to Gotham Gazette. Where it goes now is unclear.